We are the New Classics. New Classics Studios is not your average e-commerce store. Above all else, New Classics Studios is an ideology that merges classic and timeless design with quality, social responsibility, and environmental awareness. Keep scrolling or skip ahead to different chapters to learn more about who we are and why we think sustainable fashion is the key to a better tomorrow. Since the emerging of fast fashion, the nature of the contemporary fashion industry has evolved into mass trend-based consumption of low quality clothing, resulting in extremely harmful environmental and social impacts. In response to this, New Classics Studios was launched in 2014 by Alyssa Lau in Edmonton, Alberta, Canada. At New Classics Studios, we understand that the fashion industry must change in order for us to prolong our environmental and social well-being. So, with that being said, we've made the commitment to better the world through fashion by ameliorating the standards of the design industry and encouraging others to invest in their clothing and join the Slow Fashion Movement. It is only by understanding and being aware of how our clothes are made, and who makes them, that we can then start making choices that will positively impact the world. We want to use New Classics Studios as a platform to introduce and benefit the creators and designers who are initiating the way for sustainable fashion in innovative and unique ways. We believe in the brands we carry, and we believe in the aesthetic and longevity of our garments. In other words, we've curated the best sustainable and fair trade labels from around the world to show you that you don't have to give up aesthetics for ethics. Being transparent about our brands and garments. We want you to love our garments for more than their style. Fast fashion is a term used to describe businesses that sell inexpensive garments designed and manufactured in a matter of weeks in order to capture current fashion trends. It is a relatively new business model developed in the late 1990s that depends on: a) selling trend-based pieces that encourage consumers to continuously consume, and b) the Quick Response Manufacturing model of production, which prioritizes timeliness in order to generate the mass manufacture and scale of profits necessary for fast fashion to work. Let’s consider this for a moment. Fast fashion retailers like H&M and Zara produce new styles in “micro-seasons” every week of the year. That’s 52 seasons a year. In comparison, traditional fashion brands produce two to four seasons per year. This means that companies like H&M actively produce hundreds of millions of garments annually, and are often sitting on billions of dollars worth of unsold clothing. Long story short, from a consumer’s point of view, fast fashion allows us to buy the latest it-piece for the same price as a Starbucks Coffee. However, as consumers, what we don’t see is that fast fashion has an extremely high hidden cost, and it’s the environment and garment workers involved in the fashion industry’s supply chain that have to pay. As a result of the mass production and over-consumption of clothing, the fashion industry has an unbelievably large carbon and environmental footprint. In fact, the fashion industry accounts for 10% of global carbon emissions and remains the second largest industrial polluter, second to the oil industry. Ever year, the global consumption and usage of clothing leads to the release of more than 1.26 billion tons of greenhouse emissions, which is more than the amount generated by international shipping and flights combined. As clothing has become more and more inexpensive, the reality for a lot of fast fashion consumers is that throwing away their clothes and buying new is more convenient than paying for repairs. North America alone produces more than 12 million tons of waste in textiles (approximately 68 pounds of waste yearly per household), accounting for 5% of all landfill production. 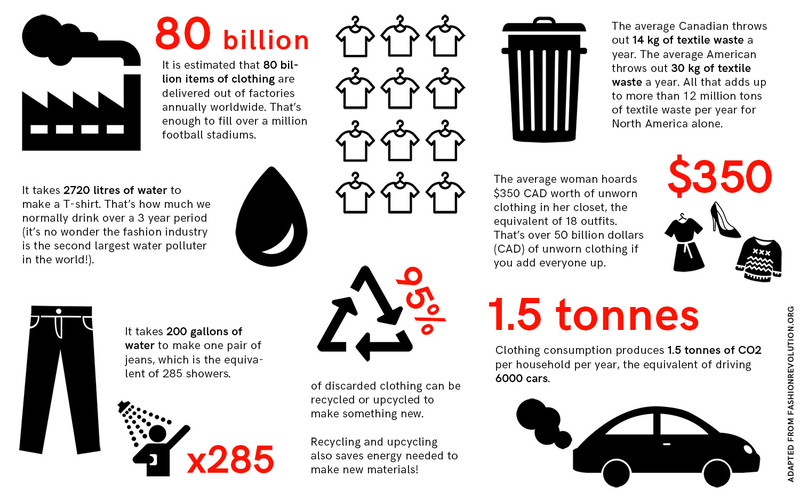 This is especially ridiculous when over 95% of discarded clothing can be recycled or upcycled to make something new. And when garments made of natural fibres (such as cotton) ends up in landfills, it behaves much like food waste and produces the methane – a potent greenhouse gas that contributes to approximately 25% of the manmade global warming we experience. On the other hand, synthetic fibres like polyester and nylon are essentially plastic fabrics made from petroleum and don’t biodegrade at all. Furthermore, both natural and synthetic fiber clothing will have been bleached, dyed and printed with chemicals during the production process and once in landfill, these chemicals leach into the soil and groundwater, contributing to the pollution of our decreasing freshwater supplies. We are literally poisoning the earth with the fast fashion garments we throw away. The fashion industry is a massive consumer and polluter of our limited fresh water supply. Only 2.5% of the Earth’s water is freshwater, and only 0.3% is accessible to humans. And according to a NASA-led study, many of the world’s freshwater sources are being used faster than they are being replenished. The fashion industry is definitely a part of this problem. Two thirds of all fibers used to make our clothing are cotton based, and although cotton is a natuarl fiber, it is a low-yield crop that wastes a whole lot of water. In fact, it requires 2720 litres of water to make a simple cotton T-shirt. That’s how much we normally drink over a 3 year period. Furthermore, roughly 17% to 20% of industrial water pollution is owed to fabric dyes and treatments resulting in the discharge of toxic chemicals into fresh water streams, the death of aquatic life, the ruining of soils and poisoning of local drinking water. In China, estimates say 90% of local groundwater is polluted, and according to the World Bank, 72 toxic chemicals in the water supply are from textile dyeing. While most, if not all first world countries have laws in place to prevent this sort of environmental contamination, it's a very different story for developing countries where many fast fashion retailers have moved their production to. One of the reasons why fast fashion garments are so cheap is because fast fashion companies have relocated their garment factories to developing countries, where garment workers experience sweatshop working conditions, unreasonably long hours of work, and are paid on average 4% of the price of an article of clothing they produce. That’s 40 cents on a $10 t-shirt. In Bangladesh, that percentage drops as low as 2 percent, where workers earn as little as 33 cents per hour. In Indonesia and Vietnam, workers are making 48 cents and 49 cents an hour, respectively. To sell garments so inexpensively, turn over new styles quickly, and deliver such high profits, fast fashion retailers rely on a business model that discriminates and exploits female garment workers as a cost saving measure. Reports developed by an international coalition of human rights organizations, unions, and other labor organizations active on the ground detail sexual violence, physical violence and verbal abuse against female garment workers on top of their already oppressive sweatshop working conditions. This is extremely significant as over 80% of garment workers in the fashion industry are women. Pulling hair, hitting breasts, firing pregnant women, threats of sexual violence and non-renewal of work contracts are just some of the forms of gender-based violence documented in the report that frame the daily realities of female garment workers across South and Southeast Asia. Furthermore, according to the Global Labor Justice, abuse towards garment workers spiked during high stress production times, clearly showing that the fast fashion industry’s impossible time and production demands are a major cause for violence towards garment workers. Applies synthetic fertilizers which are primarily made from nonrenewable sources, including fossil fuels. These fertilizers do nothing to sustain the soil and can alter the soil pH, upset beneficial microbial ecosystems, increase pests, contribute to the release of greenhouse gases, and pollute nearby environments. The pesticides used in the farming of non-organic crops are responsible for the deaths of an estimated 20,000 people a year in developing countries (WHO). 3 million people also suffer related chronic health problems due to exposure to these chemicals. Treated with harsh chemicals, like bleach and chlorine, wearing down fibers and making it less durable. The Slow Fashion movement is about creating fashion consciously and with integrity while consuming less and consuming better. The slow fashion movement is a unified representation of all the eco, green, ethical and sustainable fashion movements which intends to slow down our rate of fashion consumption. It is a solution to the fast fashion industry that instead encourages consumers to support local and small businesses, donate or re-purpose unwanted garments, shop secondhand, sustainable or artisanal, and invest in high quality clothing that will both last longer and transcend fashion fads. Ultimately, the goal of slow fashion is to get consumers to become more mindful about where they spend their dollars by consuming less and consuming better. All of the labels carried at New Classics Studios fit within the slow fashion movement in that many aspects of their production, design, manufacturing, and sourcing are all done with our environmental and social well-being in mind. We believe that transparency is key within the fashion industry where so many brands and chains have jumped onto the eco-bandwagon only to not actually be, well, sustainable. So with that being said, we always try to include the stories behind the things we sell, so you can know exactly what you're buying.